Our experience in handling properties of different types and sizes enable us to gauge which designs work and which do not. We understand that some backyard spaces cannot accommodate certain structures of hardscapes in Papillion. 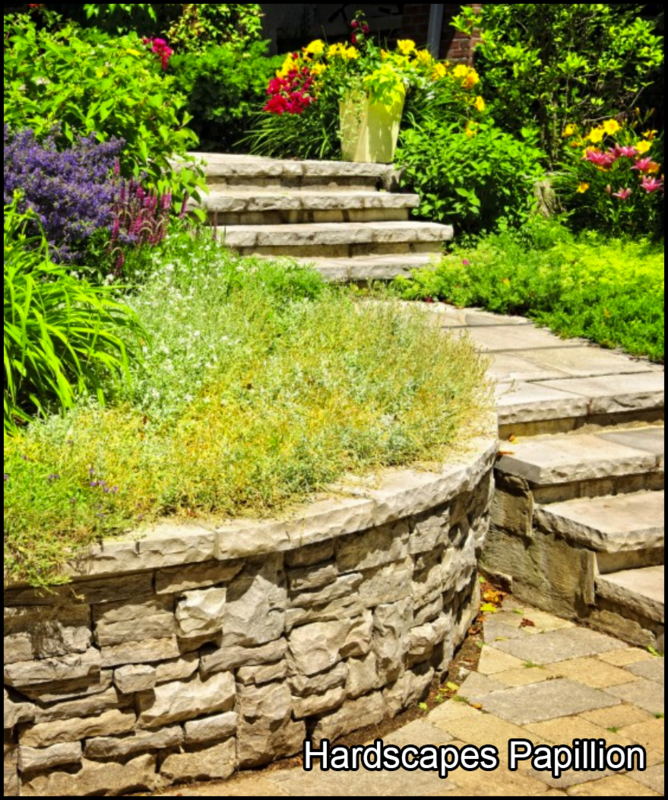 Because hardscapes for Papillion-based properties are among our expertise, we can suggest materials and designs based on the slope of your yard, the condition of the soil, and other dynamics. Count on us to listen to your vision when you choose us to build your hardscapes in Papillion. As mavens of hardscapes in Papillion, we can recommend ways on how to suitably incorporate your ideas into your property. Our technicians at Heroes Lawn and Landscape will present you with options regarding hardscapes in Papillion to help you decide which materials, designs, and other elements will suit your budget. Besides the knowledge and skills, having the right design tools and equipment is important in constructing hardscapes in Papillion. Heroes Lawn and Landscape has the right tools for installing lighting, heavy metals, and all other features needed to build your dream hardscape in Papillion. Fertilization and Lawn Maintenance – This is effective in helping you achieve that hearty and healthy turf while eliminating weeds. Heroes Lawn and Landscape understands that a well-maintained lawn showcases hardscapes in Papillion best. Lawn Care – Heroes Lawn and Landscape does a great job in mowing and leaf removal, so we don’t ruin the appearance of your hardscape in Papillion. Landscape Management – Heroes Lawn and Landscape performs efficient mulching and edging, pruning and flowerbed weeding, planting of seasonal flowers, and tree and shrub care. Holiday and Event Lighting – At Heroes Lawn and Landscape, we follow strict precautionary measures and use only safe light bulbs that will accentuate your hardscape in Papillion. Artificial Turf – If you have been wanting to have a grassy yard, but you just can’t commit to maintaining a lawn, then our artificial turf is your best option! Faux turf is one of the most loved features of a hardscape in Papillion. Mosquito and Tick Control – Are mosquitoes, ticks, and other annoying insects stopping you from enjoying your yard and your hardscape in Papillion? It is good to know that your builder of hardscapes in Papillion also provides mosquito and tick control services. Snow Removal – Prolonged exposure to snow is not good for your hardscapes in Papillion, especially those that are made from wood. This is why we use safe yet effective snow control products and procedures to get the snow off your hardscapes in Papillion. Also, we are on call 24/7 during snow season. Builds Upon Your Vision in Papillion, Nebraska: We are a collaborative contractor of hardscapes in Papillion. Our staff members are happy to set up meetings before working in your yard so we can discuss the plan. Respects Your Taste and Preference in Papillion, Nebraska: As your service provider for hardscapes in Papillion, we value your ideas. Listening to our clients’ input is of high importance to us. Our company uses products that are strong enough to eliminate ice without damaging concrete or vegetation. What’s more, during the winter season, we are on call 24 hours a day, seven days a week. Check out our Facebook page to learn more!